This programme has been created specifically for people who are looking for training experience in the UK. Training programs are normallly unpaid. The aim of the programme is to give people the opportinity to learn specific skills and experince in the desired areas. Although normally it is a unpaid programme some employers provide lunch or pay travel cost from their accommodation to work. Trainees may get paid or get some pocket money once they reach a sufficient level of experience. When the trainee has completed the program, in some caes employers might offer full or part time paid work. Alternatively, the trainees can apply for a full time paid job with a different employer provided they have sufficient work experience. InterCon UK, finds suitable training placements in many areas for trainees all around the UK. 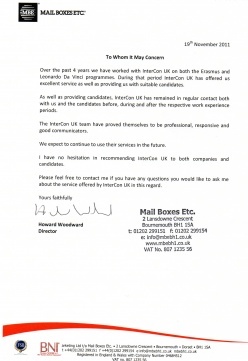 If you have any questions or would like to learn more information please email to office@interconuk.org Our consultant will contact you shortly. This page has been updated on 29. January 2019 12:15.